Chania is the largest town in western Crete and the island's former capital, a village more than a city. We were seven women visitors, ages 50 to 85, during the last weeks of September, witnessing a change of seasons with the sirocco winds blowing in to herald the beginning of autumn. Our 'perch' above the harbor gave us an unparalleled view of the workings of the town - sights, smells, sounds - throughout the day, into night. What we couldn't see from windows or a roof terrace we easily spied in short trips foraging in the streets and surrounding countryside. What makes a village is being able to become familiar with the patterns of people in only a few days. We were lucky to be staying in one of the old Venetian buildings overlooking the iconic lighthouse and mosque that mark the port - symbols of past centuries. Ruins are everywhere, in progress of being charted. It was a humble reminder of history's broad sweep to see in one of the stately shipbuilding edifices open to the public along the harbor a copy of a 16th century BC Minoan ship made to order for Greece's 2004 Olympics. Our perspective was providentially skewed as temporary denizens of Dorothy's Dream House www.dorothys-dream.com, which has a special history of its own. The duplex available for rental for groups of six (or more) was named for an American woman artist who made Chania her home for decades, cementing friendships with many of the people who still live there. (The mosque one night was the venue for a show of resident artists' works but no longer does a muezzin send out his call.) Back streets, beyond the more overt commercial byways - surprisingly full of brand names in English - artisans sell their wares in small shops under bougainvillea trees. The hills above town are wonderfully forested - row upon row of olive trees in differing shapes - between open areas where livestock roam. In one minuscule village we feasted the afternoon away on locally grown food cooked solely on wood in large decorative clay pots. Customers eat what host Stellios and his wife made that day, accompanied by homemade wine. Pork and goat, greens and salad - traditional Cretan fare - served under palapa-like shelters in a hearty breeze. On hot days we could walk to a town beach only minutes away for a swim in clear waters. Or stay secluded and cool in Dorothy's living room, feasting on a splendid library collection. Other excursions took us to Balos on the island's far western peninsula, where dreamy blue-green waters curling on white sand drew all too many others like us willing to take a rocky hike down to - alas, the all too busy beach. (A curse of sorts: the site is often found on the cover of Greek tourist brochures.) Another time we hiked at one of the area's famed monasteries where we could then buy homegrown oil, honey and wine. 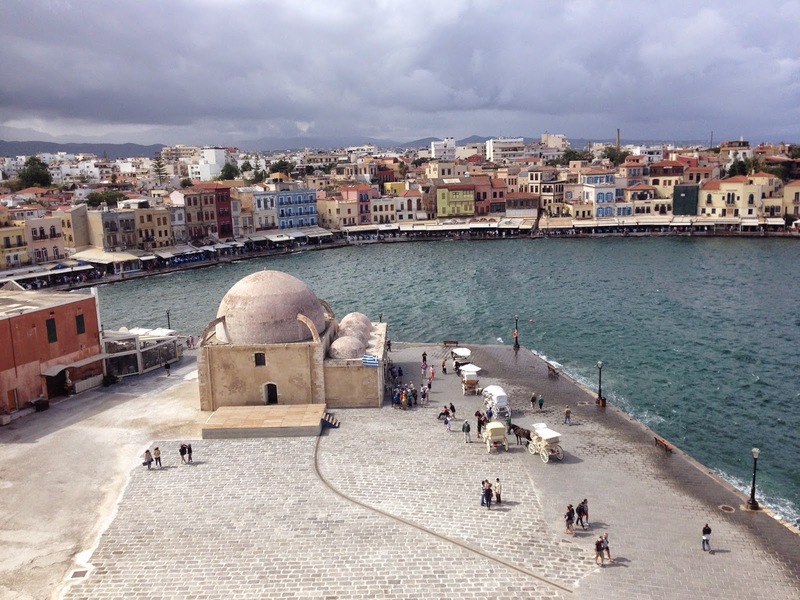 Crete is country unto itself, and Chania one of its treasures. Ann, such a lyrical piece - about one of my favourite places. Don't need an excuse to return but you've given me one - with all your observations that had not occured to me. Maggie Hall. As the owner of Dorothy's Dream where you stayed I am delighted that you had the experience we aspire to offer. Thank you for the beautifully written description of your trip. One small correction for any of your readers that may be interested to explore Chania: our website is www.dorothys-dream.com. We are also present in booking.com and trip advisor.